I'll at this to my list--I'm always looking for good time travel! Thanks. I love time-travel novels as well, so this book is definitely something I want to check out. It sounds like a wonderful read, Lenore, so thanks for shining a spotlight on it! Time travel became real to me with the Outlander series and now I think I could read more. Thank you for the review. I love time travel books, the time travellers wife being one of my favourites, and the cover just blows me away, its so tranquil and beautiful. This sounds like such a good book, thanks for the review. I haven't read many time travel stories, but I do enjoy them when I read them. This one sounds good to me. Sighing at the end is a good sign!! I love time travel too!!! Thanks for the great review! I love the sound of this one and really must read it asap! I liked this book, too. Though I was seriously torn between Amy's choices... And I really didn't like the last page, but that's just my personal preference. It was still a very enjoyable book. I am a sucker for anything WWII and this sounds awesome! Thanks for posting. I remember obsessing over time travel stories as a kid, and how about Somewhere in Time???? I've surrounded myself with them again with Outlander. Doesn't bother me if I don't understand it or that it can't happen. I love to pretend. This sounds sweet. I did quite love Tuck Everlasting and do love a bit of a time-travel-impossible-love-story! i'm also a fan of time travel--and there are a few YA novels that offer it up. my students love when characters can see ghosts, travel through time, and the like. caroline b. cooney did a trilogy they love and so did meg cabot (mediator). i'm going to check out 'the clearing' to see if it will work for my kiddos! thanks for the tip. I'm sensing that this is sort a Time Travler's Wife for young adults. Sounds great! Thank you for the lovely review, Lenore. I agree with Tabitha about the ending but I still really enjoyed reading this one. And I adore the cover. At first, I thought this was the novel version of that Robert Redford/Helen Mirren movie that came out a few years ago. 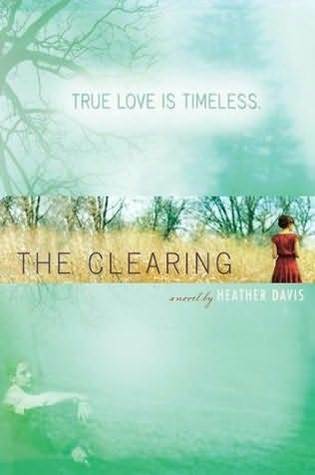 And then I read your review and see they are two drastically different stories called "The Clearing." Haha! But now you've gotten me intrigued enough to add it to the 'to read' list! I just finished the book . . . well a few seconds ago actually :P While I was reading it, every once and awhile you'd hear me go "awwwwww! :)" over the things that Henry did. Don't you just love his chivalrous style?